There was once a small alley in Alexandria, Virginia that people drove along to get from one road to another. Now, there is a small blue house in the same spot. The house is positioned between a red one and a white one, giving the appearance of a flag on the street. If you blink while you’re driving past the house, you might miss it since it’s so small. This house is only about 7 feet wide and extends back about 25 feet. It has been deemed by many organizations as one of the smallest homes in the country, but that hasn’t stopped people from trying to live there or at least get inside to take a look around. 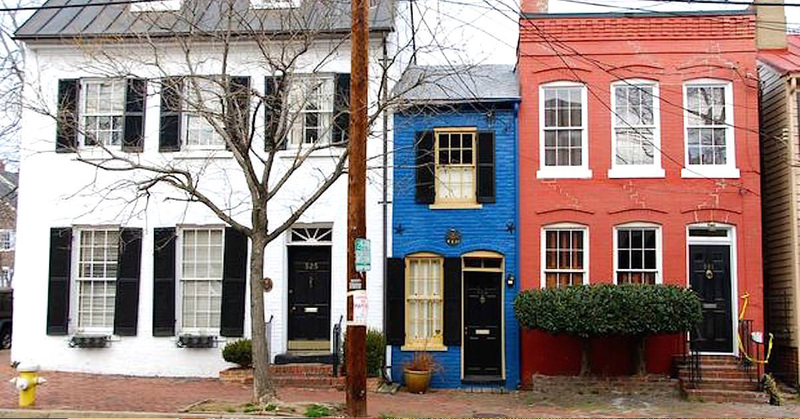 John Hollensbury built the “Spite House” in 1830. It was designed as a way to keep people from taking their horse-drawn carriages down the alley. There are still areas along the walls where the wheels of the wagons would brush against the other two homes that were built before the tiny blue house. The house was bought by Jack and Colleen Sammis in the early 1990s, and it functions much like a traditional house would. There is a kitchen as well as a garden behind the home. It’s been remodeled so that it has all of the comforts of similar houses in the area but on a smaller scale.